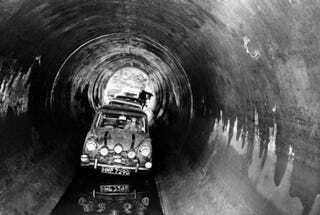 Top Gear is planning to recreate the most famous scene from The Italian Job, racing Minis through Belfast's Sewers. Belfast? Well, James May doesn't like Italy. Belfast has just completed construction on a new sewer system, meaning Clarkson, the Hamster and May won't have to splash through human waste in the name of infotainment. While the original 1969 film was set in Turin, Michael Cain was actually driving through Coventry's waste disposal system.